This tutorial shows the installation of an IRC server with IRCD-Hybrid and Anope on Ubuntu 15.04 and how to secure the IRC connections with SSL. IRC (Internet Relay Chat) is a text-based chat protocol which has an open specification. There are several IRC servers and clients available which implement IRC. IRCD-Hybrid is a lightweight, high-performance Internet Relay Chat daemon used by e.g. EFnet. We will use this software in our tutorial for Ubuntu 15.04. Anope is a set of IRC Services that provides flexibility and ease of use with support for 15 IRCds including IRCD-Hybrid. Anope is available in 2 versions: Stable and Development. We will use the Stable version here. An Ubuntu 15.04 server, I will use the IP 192.168.1.109. Install ircd-hybrid under user "mavis". Install in a directory called "hybrid", under mavis home directory. "/home/mavis/hybrid/". Now go to the mavis home directory and change the owner of the "hybrid" directory. 2. Then enter the anope directory. 3. And compile and install anope. These are the same steps that we used to install ircd-hybrid. I will install it under user "mavis" as well into the directory "services". and you will be asked "where do you want to install" anope. Enter the following directory "/home/mavis/services/" and then press "Enter". Next enter the "build" directory and then use a command "make && make install" to compile and install anope services. When the installation is complete, go to the mavis home directory and change the owner for directory "services" to user "mavis". 1. Before you edit the configuration file, please generate a password with "mkpasswd" command in the "bin" directory. This password is used later for the admin/operator access. 2. 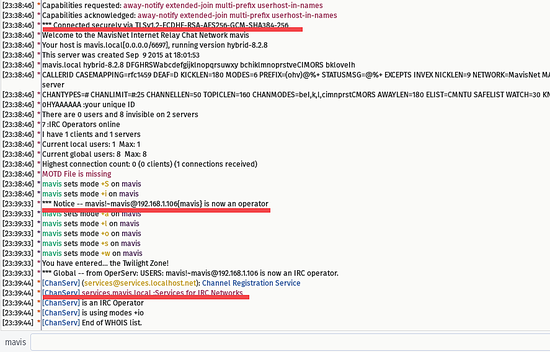 Now switch to user mavis to configure ircd-hybrid. Please go to the directory "hybrid/etc/" and copy a file "reference.conf" to a new file "ircd.conf". 3. Edit the file ircd.conf with the vim editor. Then save the configuration file. Try connect to your IRC server with an IRC client like mIRC, hexchat or xchat. 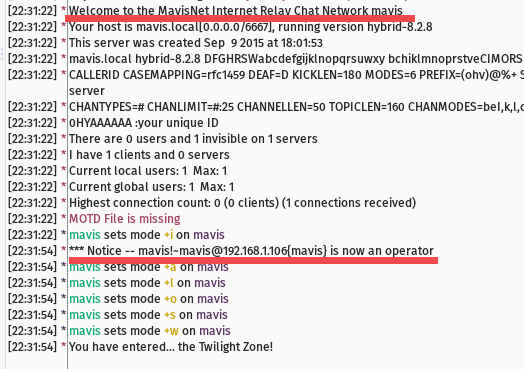 Login with user mavis, try to be an operator/admin. 1. Go to the anope installation directory as user "mavis" and copy the file "example.conf" to the new file "services.conf". 2. Edit the configuration file with the vim editor. Edit the uplink block in line 154 - this is used by anope for the connection to ircd. Make sure this configuration matches with connect block in the ircd configuration. Then change the serverinfo block in line 198 and make sure it is matches with the connect block in the ircd-hybrid configuration. Finally you have to define the ircd software that you use in the module block in line 260. Change "inspircd20" to "hybrid". 3. Run the anope services. 1. 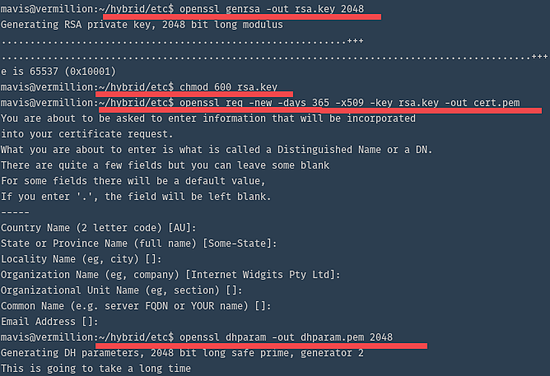 Before you edit the ircd-hybrid configuration, you have to generate a SSL certificate for ircd. Please go to the "hybrid/etc/" directory. Enter your data like Country etc. when requested by OpenSSL. Just wait, because it will take some time. 2. 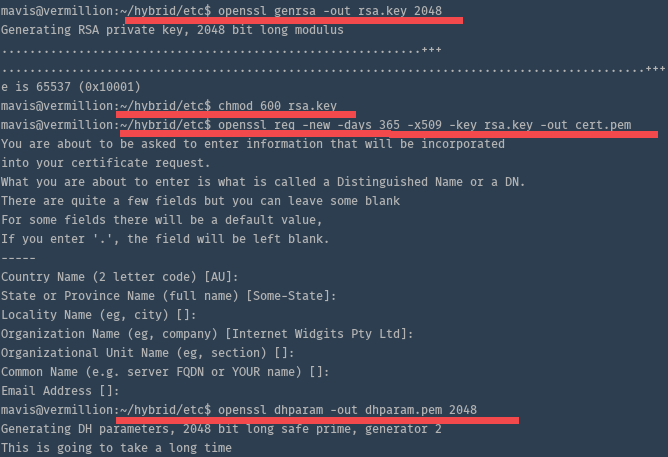 Now go to the hybrid directory and edit the configuration file "ircd.conf". And finally you have to comment the host in the listen block at line 353.
note : 6697 is default port for SSL Connection on ircd-hybrid. Now you can see that we are connected with SSL and that we can be a operator/admin of our server, so the anope is working. Internet Relay Chat(IRC) is an open (client/server) protocol for text-based chats, it is one of the foundations of the internet and still used by many developers and sysadmins. The IRC Server is a computer/server running an IRC daemon, the IRC client is a small program that the user can install on their system as chat client. IRCD-Hybrid is an lightweight and easy to configure IRC Daemon with support for SSL connections to secure the IRC network. Anope is a set of services for IRC Networks. 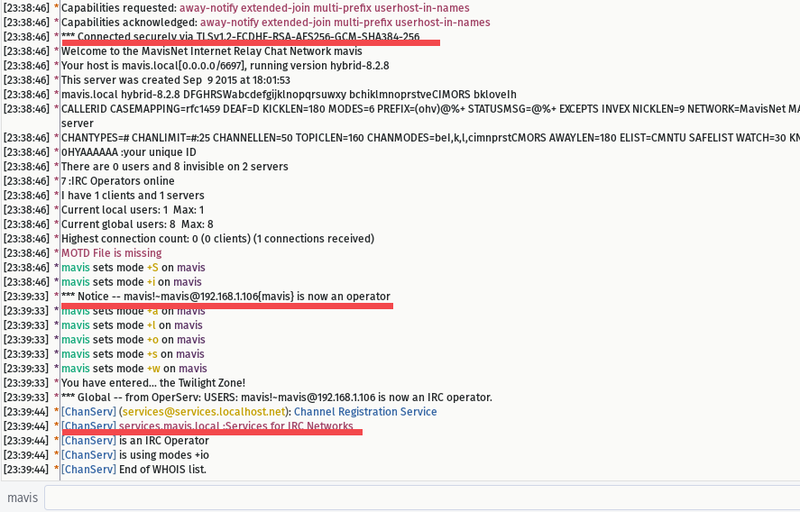 With anope you can easily manage your IRC network. IRCD-Hybrid, Anope and SSL are one of the best solutions to build your own IRC Server. How do i mention the channels to be joined and users who can join the channels? Thanks a lot for this exhaustive tutorial. It works perfectly fine. Keep it up!